I have loved all of these books, especially since I have been reading them aloud to my boys. Even though they are 10 and 8, I love reading to them, and I like to hope that they still enjoy it as well. These books have all been action-packed and fun, and this one was no exception. There were the usual characters plus a few new ones, and I enjoyed seeing how the series came together in the end. I thought it ended well and my boys liked it, except for the kissing scene (oohhhh-I won’t tell you who was kissing), which I think they liked but they won’t admit it. Hahaha. There were some good twists and turns in the storyline, and some surprises. Some of it was a little predictable as well, but not enough to make us dislike it. There was a little more violence in this book, and some of it was a bit graphic, but it was a war for Western civilization, so it was expected. I highly recommend this series! It is fun with a bit of hidden education in it, which I love. Recommendation: 3rd grade and up. If your child has read the previous ones then he/she should be fine with this one. It is a little more violent, but my third grader did fine with it. I still recommend a mythology lesson with these books, if they are not being read aloud. This is a young adult book. It is a fun and easy read. I read it to my kids and they LOVED it! They are downstairs right now playing “Percy Jackson.” It’s great and I love it! I love stories that draw kids in and make them enjoy reading. I liked it myself, even. 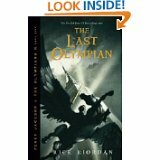 I liked how Riordan brings boring Greek mythology to life in this modern era. Mount Olympus right above New York City??? Awesome! There was suspense, mystery, action, betrayal, sword fighting, and monsters. What could be better??? I would definitely recommend this book. I wouldn’t quite put it up with Harry Potter, but close. Like I said before, I love books that pull kids in, and this one does just that….plus it’s fun for me too! Rating: PG (6 and up) My 4 year-old heard bits and pieces and wasn’t too interested. She didn’t understand a lot of it. It is a great read-aloud. There are some parts where I could tell they may have understood it better if they had seen the writing and so I did show them, but for the most part it was a great read-aloud. My 8 year-old could have read it by himself. He would have understood most of it. He would be able to read the words, but complete comprehension??? I don’t know. There were gods’ names that I didn’t know how to pronounce. The mythology is a little over their heads. They had no idea what the River Styx was or the Underworld or even Mount Olympus. For that reason I was glad I read it to them. I think they would have understood most of it but things like those I mentioned above are important pieces to the story so if they don’t know what they are then they won’t grasp the whole meaning. There is some monster violence but no profanity. Great for kids. Recommendation: Third Grade and Up. If your third grader is reading it alone, a lesson on mythology is a must! Also, help with pronunciation would also be helpful.